A couple more shots of the Icelandic Poppies, I took on Thursday. They really are beautiful. 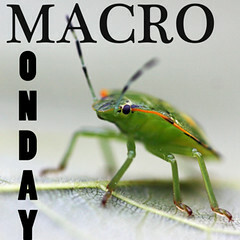 Now go visit Lisa, to see who else played Macro Monday, today. ..those really are amazing macro shots! wonderful! I so right now want you to adopt me so I can some and take pics of these beautiful babies! Beyond any of the pretty words I can think of! Just beautiful - I like that there seems to be a star in the first one. Like a burst of sunshine Jan. Something we all can use around here! SUPERB MM shots! Icelandic Poppies are some of my favorite flowers and they just scream SPRING to me. Thanks for making me smile! These are amazing shots Jan...so vivid! "exquisite detail" was the phrase that came to mind. I see someone else already beat me to that one but I'll stick with it anyway! Really like the pictures. Wow, excellent images. Just terrific. Love poppies! And you took great macros! Great details in those macros! Jan that first one just pulls me in. I love all the frillies against that white background!